Absolute Fire Protection, Inc. earns an “A” safety rating from Akzo Nobel, Inc. for its safety record and company policies. 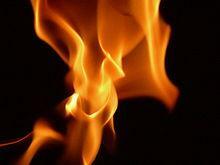 Absolute Fire Protection takes safety very, very seriously, it is a top priority for us. We are very proud of this “A” rating and have worked very hard to achieve it. Akzo Nobel Inc. develops and manufactures chemicals, coatings, and health care products. Its chemicals business includes catalysts, functional chemicals, polymers, pulp and paper chemicals, and surfactants. The company also offers coatings, such as car refinishes, decorative coatings, and industrial coatings and finishes. In addition, it offers a range of health care products, which include oral contraceptives and antidepressants, veterinary vaccines, and pharmaceutical raw materials. 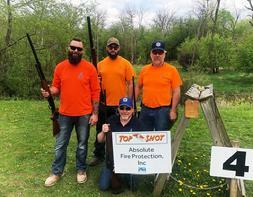 Absolute Fire Protection, Inc. sends a team to the NIBCA Sporting Clays Challenge. Great day for the shooters at the Upland Hunt Club just North of Davis Junction, IL. Blessed with a bright sunny day the teams shot 100 clays for the day ending with a great catered steak dinner and a cold beer. On team Absolute was (L to R) Josh Miller, Kevin Ambrozewski, Jr., Kent Sester and Shane Banta posing at Station #4 sponsored by Absolute Fire. A good time was had by all! We look forward to continuing this participating tradition. The Northern Illinois Building Contractors Association (NIBCA)represents over 100 contractors and industry affiliates, provides a full time staff of professionals, engages the services of a public relations consultant, an attorney for member use and a legislative liaison in Illinois and Washington. Absolute Fire Protection, Inc. earns an “A” safety rating from Kraft Heinz for its safety record and company policies. Absolute Fire Protection takes safety very, very seriously, it is a top priority for us. We are very proud of this “A” rating and have worked very hard to achieve it. In order to continue to be one of the world’s premier food companies, Kraft Heinz has developed a set of Global Principles which convey Kraft Heinz’s values and commitments to its employees and to the public. As part of Kraft Heinz’s efforts to foster relationships with contractors who share similar values, Kraft Heinz is requiring compliance to its Contractor Guiding Principles by contractors with whom Kraft Heinz has a contractual relationship. Annual CRÈME BRULEE day at the office courtesy of Kathy and Phillip Clausen. Outstanding. Homemade crème brulee with real whip cream, strawberries and raspberries. Thanks Kathy and Phillip! Absolute Fire Protection’s 10th annual company dinner, once again at Texas de Brazil in Schaumberg, IL. Open bar, all the meat you can eat, and $10,000 cash in prizes; tough not to have a good time! Absolute Fire Protection’s TENTH year celebration, how time flies! 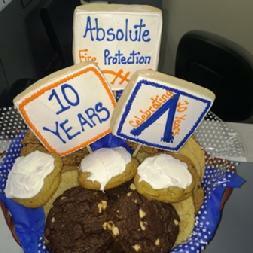 Happy birthday to Absolute Fire Protection, Inc., we are TEN years old today! Ten years ago John Ginsberg, Tim Sester and John Danis opened the doors to Absolute Fire in a tiny rented office/shop space in Loves Park, IL. Just the three of them wearing every imaginable hat necessary to run a business; sales, design, billing, reception, collections, all while trying to build customer, banking and bonding relationships. Hard to believe we have come so far with such success, especially given the economy. Now with millions and millions in sales under our belt we are blessed with Fortune 100 customers, we provide our services to some of the biggest general contractors in the Nation, have no debt, cash in the bank, preferred bonding rates and operate out of a state-of-the-art 15,000 square foot office/shop that we own. We would like to thank all of our employees, customers, suppliers, professional partners, banks and bonding company, all pulling in the same direction your faith in our idea has paid off. Proof that hard work really does pay off, GOD BLESS AMERICA! 2016 has been a busy year and we are happy to share our success with a number of area organizations whose good work and efforts benefit all of us. Welcome Shawn to our design team, 1 down, 2 to go. 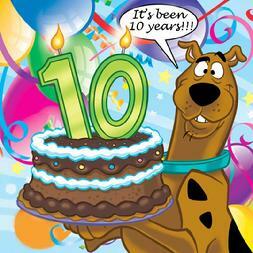 Join us now in time to help us celebrate our 10-year birthday this October! Jaymes Crozier (L) and Shane Banta (R) hit the links at Glendale Lakes Golf Club for the annual fundraising event for the Illinois Fire Prevention Association. Absolute Fire Protection, Inc. was a proud sponsor. A good time was had by all, THANKS GUYS! In our new company color, ONYX BLACK, we are excited to add to our fleet of trucks and vans. This year we have added a new service van, shown here, and three new pickups. Absolute Fire Protection, Inc. establishes a new Safety milestone by working 2100 days without a work related injury. Absolute Fire Protection, Inc. establishes a new Safety milestone by working 2100 days without a work related injury. Absolute Fire Protection is highly committed to workplace safety and has developed and implemented a strong safety program. Our award-winning safety program is a direct reflection of the company's commitment to protect our most valuable resource, OUR PEOPLE! Our goal is to be accident-free! Prior to this 2100 day record Absolute Fire Protection has only ever had one work related injury resulting in a National Council on Compensation Insurance, Inc. (NCCI) worker’s compensation mod of 0.80 which is 20% below that of our industry peers! We will not compromise job site safety. 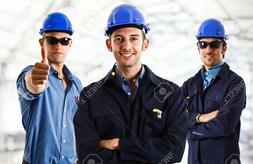 Managers, supervisors and employees are all trained to identify and correct unsafe acts and unsafe conditions. Our project teams administer our Corporate Safety Program at the project level, with the support and oversight of a dedicated management team. “The stakes are high, as our projects are executed in occupied schools, active hospitals, libraries and manufacturing facilities, where children, patients and businesses count on us to ensure their safety and business continuity. To us, safety is not just implementing policies. It’s a deeply held value,” says John Danis, President. Absolute Fire Protection, Inc has been honored by the ASA (Association of Subcontractors) Chicago for its outstanding safety record. Absolute Fire Protection’s sprinkler system installed at the Orland Park Granite City Food and Brewery in 2007 credited with saving the building after an afternoon fire. An Orland Park restaurant and craft brewery was closed overnight following a Friday afternoon fire. Fire sprinklers are being credited with mitigating damage and stopping the spread of the fire at Granite City Food and Brewery, 14035 S. La Grange Road. Officials said the fire would have caused significantly more damage if it were not for the sprinkler system. Firefighters who arrived on scene about 4 p.m. Friday found smoke in the brewing room and a small fire that had been contained by two sprinkler heads. The fire was confined to an upstairs corner and away from the kitchen and dining areas. No one was injured, and investigators believe the fire was an accident. The restaurant was expected to be open by 4 p.m. Saturday. ABSOLUTE FIRE PROTECTION, INC receives a score of 77 points out of 80. The State of Illinois Capital Development Board preforms their evaluation of Absolute Fire Protection, Inc. and gives us a score of 77 out of a potential 80 points! The evaluation scores our performance on 16 different elements such as communication, timeliness, and scheduling, prompt payment of subcontractors, safety and work quality. We are proud of this score and will shoot for the remaining 3 points on our next review! Absolute Fire Protection receives 85 out of 85 points for our safety record and safety programs from Isnetworld. Isnetworld is a global leader in contractor and supplier management supporting more than 330 Hiring Clients in capital-intensive and public sector industries to help manage more than 50,000 contractors. The stakes are high, as our projects are executed in occupied schools, active hospitals, libraries and manufacturing facilities, where children, patients and businesses count on us to ensure their safety and business continuity. To us, safety is not just implementing policies. It’s a deeply held value. Absolute Fire Protection, Inc has also been honored by the ASA Chicago (Association of Subcontractors) for its outstanding safety record. Absolute Fire Protection’s team participating in Northern Illinois Building Contractors Association (NIBCA) first annual Top Shot Sporting Clays Challenge 2013. 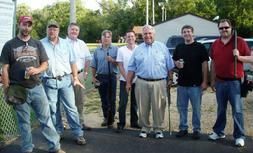 The event was held at the Upland Hills Hunt Club in Davis Junction, IL, we were a station sponsor and had a great time. 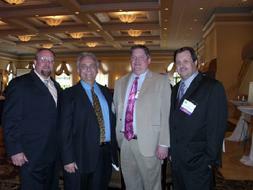 Our team, from left to right: John Ginsberg, Tim Sester, John Danis, Chris Howard. Not pictured, because he was kind enough to take the photo, was our 5th member and best shooter (with a score of 70), Ron Rudolph of WIPFLi, LLP. 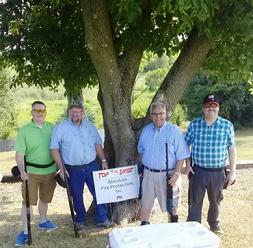 The gang shooting at Plug & Pellet Sportsman's Club, 8-1-13, had a great time. From left to right: Josh Miller, Tim Sester, John Ginsberg, Kent Sester, Joe Renner, John Danis, Rob Leombruni and Chris Howard. 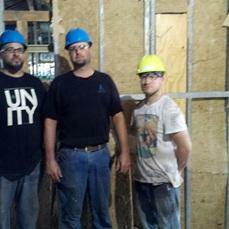 (left to right) J Vargas-Machuca, Jeff Vautsmeier and Eric Boehmer working at our Kishwaukee College job site. The 78,000 square foot new Student Services Building will also include significant interior renovation of existing structures. Absolute Fire Protection, Inc. is once again a proud Milestone sponsor of the Elgin Community College Foundation’s 15th annual Founders' Day Brunch. The brunch's theme of "Some Dreams Just Need a Little Help," focuses on students attending ECC for the first time and those lacking the financial resources to continue their education. "I'm always so touched and inspired by the students we hear from during the brunch," says event Chairwoman Phyllis Folarin. "The obstacles that many students face and the persistence they exhibit in finding ways to continue their educational commitments in spite of unfavorable odds are quite remarkable." Proceeds from the event will benefit the ECC Foundation Resources for Excellence Annual Fund, which provides immediate support for the areas of greatest need as students strive to achieve their educational goals. 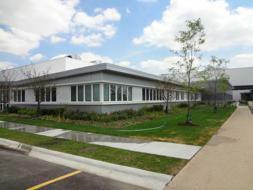 The U.S. Green Building Council awarded the Joliet Junior College (JJC) Facility Services Building a LEED New Construction 2009 (NCv2009) Gold certification – making the Facility Services Building the first of its kind on a higher education campus to receive this level of certification. Absolute Fire Protection, Inc. is a proud participant in the project providing the custom fire sprinkler systems for the 42,000 sqft facility. Designed by Legat Architects and built by Gilbane, the Facility Services Building’s new mechanical and electrical systems resulted in a 42% reduction in energy use and an annual savings of approximately 37% in operating costs. Gilbane oversaw the procurement, installation and commissioning of all the LEED systems, working with contractors to ensure that they used LEED-compliant materials and submitting the documentation for all of the LEED construction-related points. The team also worked with JJC to lead a significant construction waste recycling effort. Thanks goes out to to Jeff Vautsmeier of Absolute Fire Protection, Inc., third from the left, for volunteering his time with his fellow Local 669 Sprinkler Fitters who assembled instructional fire sprinkler risers for the Rockford Fire Academy. The Rockford Fire Academy trains firefighters on the operation and use of various types of equipment. Now they can gain real life experience with the various types of fire sprinkler systems and risers they may encounter in the real world. Absolute Fire Protection, Inc. was a proud donor of a portion of the equipment and materials used in the construction. Absolute Fire Protection, Inc. was a proud participant in the construction of the new BE Aerospace facility. The fire sprinkler system installed utilizes ESFR sprinklers designed in accordance with FM Global standards. 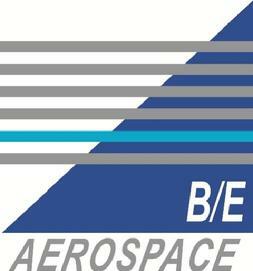 B/E Aerospace, Inc. (Nasdqa: BEAV), the world's leading manufacturer of aircraft cabin interior products and the world's leading distributor of aerospace fasteners and consumables, celebrated the grand opening of its new 38,000 square foot Ecosystems assembly facility in Rockford, Illinois yesterday. The 38,000-square-foot, two-story building was built by Logistics Parkway LLC and is leased by B/E Aerospace, Inc.. Logistics Parkway was formed by Cord Construction. Absolute Fire Protection, Inc. is once again a proud sponsor of the annual Elgin Community College Foundation Golf Classic, this year marks the 14th year. The benefit, to be held on June 18, 2012 at the St. Charles Country Club, will benefit the ECC Foundation’s mission in support of student scholarships, programs and emerging needs. Absolute Fire Protection, Inc. is a very proud sponsor of the first annual FireFighter Battle to benefit the Rock River Chapter of the American Red Cross. On June 23rd, 2012 Firefighters representing fire departments throughout four counties (Winnebago, Boon, Ogle and Lee) will converge at Sportscore II in Loves Park, IL to see which firefighters are the best of the best. This action-packed, fast-paced event is unlike any other an you will want to be sure your company or organization is part of this inaugural event to benefit the Rock River Chapter of the American. Absolute Fire Protection, Inc. participated in this year’s Elgin Community College Foundation 13th annual Founders' Day Brunch, “Building Our Future: It Begins With a Strong Foundation”. Proceeds from the brunch benefit the ECC Foundation General Scholarship Fund and the Annual Fund. In attendance for Absolute Fire Protection was Tim and Deb Sester, Tim is Absolute’s Field Superintendent; John Danis; and Cory and Carolyn Vangsness, Cory is Absolute’s Site Forman. Brunch guests were treated to an opening champagne reception followed by an upscale gourmet meal. This year's theme represents the myriad master plan construction projects visible throughout the campus. Since its inception in 1984, the ECC Foundation has provided more than $1 million in financial support that benefits students through scholarships and academic programming support. Absolute Fire Protection, Inc. is once again a proud sponsor of the OSF Saint Anthony Medical Center Pink Ball. For over 50 years, the OSF Saint Anthony Pink Ball has been a Rockford tradition. 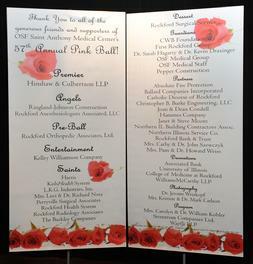 Sponsored by the OSF Saint Anthony Medical Center Foundation, the 58th Annual Pink Ball will be held beginning with a champagne reception at 6 p.m. on Saturday, January 28, 2012, at Giovanni�s Restaurant and Conference Center in Rockford. Chaired by Mrs. Anne and Dr. David Cable, the black-tie Pink Ball event includes gourmet dinner, music and dancing. In honor and recognition of the extraordinary professionalism and caring displayed by the nurses at OSF Saint Anthony Medical Center, proceeds from the OSF Pink Ball will help support and expand the Nursing Excellence Endowment Fund. This fund provides the necessary resources for OSF nurses to enhance their professional practice while improving the quality, efficiency and safety of patient care. For information about sponsorships and tickets, call 815-395-5333. 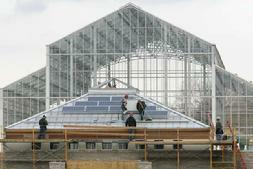 Absolute Fire Protection, Inc was a proud participant in the construction of the Nicholas Conservatory & Gardens. The 22,000 square foot facility was a real fire sprinkler engineering challenge given the open glass and steel construction. Everything was custom designed and field fitted to maintain the highest standards of protection and aesthetics. 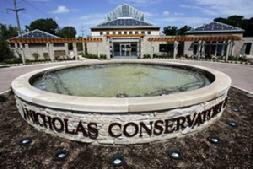 After breaking ground just more than two years ago, The Nicholas Conservatory is set to open on Saturday, 10-29-11. 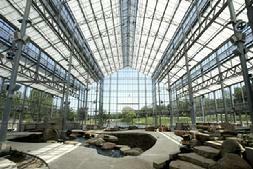 The 22,000 square foot facility will be a new staple on the Rockford Riverfront. All of it thanks to the more than 1,600 different people who donated to the project. "Over $12 million in private donations," said Rockford Park District Executive Director Tim Dimke. "That says a lot for what the Sinnissippi Riverfront and what the facility means to the entire community and the entire county." Absolute Fire Protection is a proud Eagle Hole Sponsor for the annual RYAN MICHAEL THOMAS MEMORIAL GOLF PLAYDAY to be held July 23, 2011 at the Westlake Golf Course. In the short time Ryan was on this earth he accomplished many things. He was also a volunteer fire fighter for the Win-Bur-Sew Fire Department where he had just earned his black helmet. 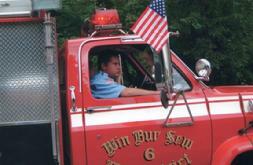 Ryan loved the Fire Department and they loved him. Ryan was a son, brother, uncle, grandson, nephew, cousin, and friend to all who loved him. 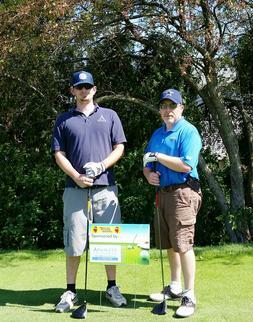 Absolute Fire Protection, Inc. is a proud sponsor of the 13th annual Elgin Community College Foundation Golf Classic. The benefit, to be held on June 20, 2011 at the St. Charles Country Club, will fund the ECC Foundation annual fund and the athletic department�s programs and scholarships. ABSOLUTE FIRE PROTECTION IMPLEMENTS THE UA STAR PROGRAM! What Does the UA STAR Mean to Your Company�s Bottom Line? Absolute Fire Protection�s sprinkler fitters work more efficiently, work safer and work smarter. Your job gets completed on time and you save money because the work is done efficiently and you have the peace of mind of knowing it�s done right! For all your buildings� service, maintenance and repairs, insist on Absolute Fire Protection�s UA STAR Fire Sprinkler fitting Technicians. They�re the STARS in the industry! Construction began March 10, 2010 and was completed on February 25, 2011. Wallace is a Pre-K through 8th grade building able to comfortably house 450 students; the facility is 71,232 square feet. Absolute Fire Protection, Inc has been recognized by the ASA Chicago (Association of Subcontractors) for its outstanding safety record. Absolute Fire Protection is highly committed to workplace safety and has developed and implemented a strong safety program. The attached photo shows Absolute Fire Protection�s management team accepting the award, from left to right, Tim Sester, John Danis, John Ginsberg and Chris Howard. Absolute Fire Protection, Inc. purchases the Rosetech Industries facility from Rockford�s Rosecrance Inc. Located at 5279 28th Ave in Rockford�s East Rock Industrial Park, the facility is approximately 14,000 square feet with 4000 square feet of office, an open air interior court yard, two crane rails and 25 foot clearance on 2 acres. Absolute Fire Protection is a full-service Rockford-based fire sprinkler contractor serving northern <?xml:namespace prefix = st1 ns = "urn:schemas-microsoft-com:office:smarttags" />Illinois. 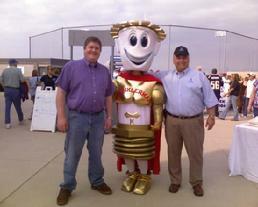 July 9, 2009 Absolute Fire Protection, Inc. welcomes NFSA�s very own Sprinklerman at the Rockford Riverhawks minor league ball game, he was the hit of the game. Sprinklerman not only threw out the first pitch but he made friends with hundreds of fans. He then visited with the local fire departments which were on hand for the game. Employees of Absolute Fire Protection were out in force and enjoyed the game. Absolute Fire Protection�s project, the FHN Family Healthcare Center-Burchard in <?xml:namespace prefix = st1 ns = "urn:schemas-microsoft-com:office:smarttags" />Freeport, received Modern Construction magazine�s Best of 2008 Award of Merit. The project is in the magazine�s December issue, and the company will be honored at an award luncheon in Chicago. Absolute Fire Protection provided the fire sprinkler systems for the medical center. The magazine consulted an independent panel of experts who judged projects on quality, overall project management, teamwork and service by industry. 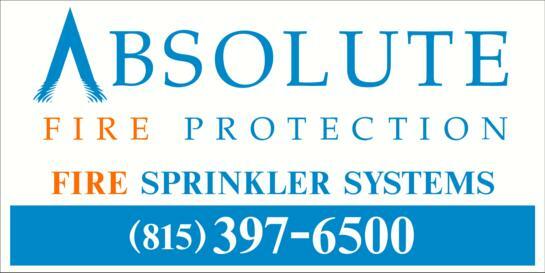 Absolute Fire Protection is a full-service Rockford-based fire sprinkler contractor serving northern Illinois.